Part of the Association’s mission is to ensure that consumers make informed decisions. As such, we have dedicated a number of pages on our website to accomplish just that as you can see from some of the links beside or as you browse through our main sections on recycling, composting, and waste. We have developed a number of publications to educate everyone about waste management activities. We also have people that reach out into the community to make presentations, attend fairs and participate in parades. You can reach us via our contact page or simply call us at 1-800-265-9799 to make arrangements to suit your event. We even present information of where we came from, what’s left in the waste bag today, and where we might go to next. The average Bluewater Recycling Association household generates 77% less waste today than it did in 1987. The amount of waste generated by the average household in 1987 was 920kg per year, or nearly one tonne. The average rural household in Ontario in 2008 disposed about 544kg. 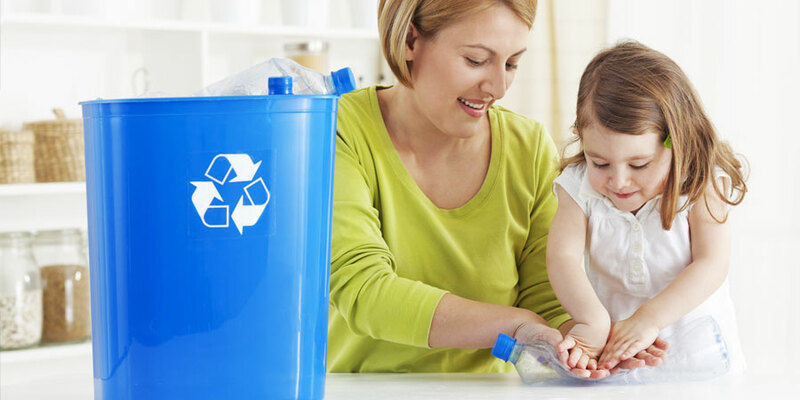 We are proud to report that our average households are disposing a mere 214kg per year. These numbers are not only impressive, but some of the best in Ontario and Canada exceeding all goals. The current Ontario government goal is to reduce the amount of waste disposed by households by 60% (368kg) by 2008. We are far beyond that goal, and aim to push the envelope even further. Ever wonder exactly what the average resident we service throws away in their bags? Well we have sorted through hundreds of bags to be able tell you! This has many benefits as you’ll see. The figures are in kilograms per household per year (kg/hh/yr), and the percentages are as a whole. Items such as ‘styrofoam’ packaging and coffee cups are often cited as materials missing from our program, but they make up less than 1% of the waste disposed and have limited or no markets available on top of having enormous costs associated with them. In comparison, the results clearly show that organic materials (food etc.) make up the majority of the average garbage bag, with developing markets and a cost to manage set slightly higher than waste disposal. 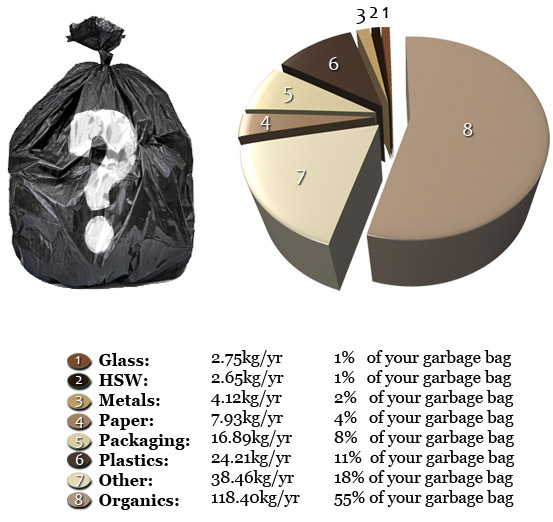 Therefore, it is more likely that our next major focus on waste reduction will be centered around what makes up 55% of the garbage bag instead of less than one percent for such items as coffee cups and styrofoam! The Association has a wealth of information throughout the website. Click on the buttons below to visit specific pages to learn even more!